An imposing late-Victorian mansion, which has played a role in the social and civic history of a Tyneside town, is on the market for the first time in almost 30 years. 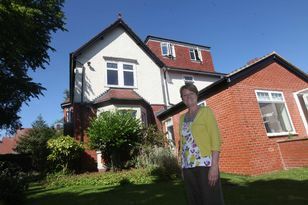 Belle Vue is in Harton Village, a leafy part of South Shields, and has been the home of Joyce Thornton since 1985. She and husband Stewart brought up children Helen, Anna and Philip there but Stewart died two years ago and Mrs Thornton feels it is now time to move. Belle Vue was built around 1895 and offers period features like original fireplaces, high ceilings and cornicing, as well as a 43ft wrap-around conservatory which was put in by the Thorntons. After the First World War the house was occupied by a mayor of South Tyneside, Alderman Edward Smith, and was requisitioned by the Army in the Second World War. Another previous occupant was South Shields solicitor and estate agent Bill Fantarrow who also owned snooker clubs in South Tyneside. It was while he was living in Belle Vue that it played host to snooker giants of the 1970s like Alex Higgins, playing in charity matches staged in the huge snooker room covering the whole of the top floor of the house. Belle Vue is approached through big entrance gates, fitted by the Thorntons and leading into the gardens, which are mainly laid to lawn with shrubs and cypress trees offering a good deal of privacy. The house itself has the original and impressive front door which leads on to a large reception hall with panelling and coving. There are three main reception rooms – a drawing room, sitting room and dining room – again with panelling, coving and cornicing and period fire surrounds. A good-sized kitchen is fitted with modern units and double range-style cooker and a picture window gives views of the gardens. A breakfast room, cloakroom and playroom/study complete the ground-floor layout while the 43ft conservatory has Victorian-style floor tiles and French doors to a terraced sitting area. The first floor has a landing with doors leading off to a single bedroom, bathroom and separate toilet. There are two more landings which give access to three double bedrooms with fitted wardrobes, an en-suite master bedroom, a sixth large single bedroom and another bathroom, as well as the snooker room on the top floor which has two mirror-image feature fireplaces, a dormer-style window, ornate decorative ceiling and fitted eaves storage cupboards. Although the house has the grace, style and sense of space belonging to an earlier era, it is nevertheless surprisingly easy to look after, said Mrs Thornton. Belle Vue, 8 North Avenue, Harton, South Shields, is on the market for £749,950 through Andrew Craig, tel: 0191 427 1722.